316L stainless steel plate meets ASTM A240 criteria. Our 316L stainless steel plate is hot rolled, annealed and pickled. 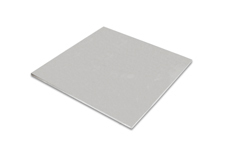 The 316L stainless steel plate does not have a polished or brushed finish and does not come with a protective PVC to prevent scratching as it is typically not used for aesthetic or cosmetic uses. Our 304 Stainless Steel Diamond Floor Plate has the same properties as the standard 304 stainless steel except it has the raised tread pattern to improve traction. 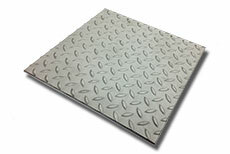 Stainless steel diamond floor plate has a hot rolled, annealed and pickled (HRAP) finish and not the bright finish commonly seen on aluminum diamond tread plate. Its name reflects its most common use, which is flooring, or any other situation that traction may be needed, along with the high corrosion resistance and strength that 304 stainless steel provides.